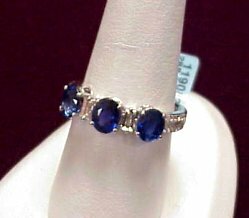 Super color in these AAA quality, three oval cut matched Blue Sapphires 2.84CT TW, set with 28 pave diamonds (0.15CT TW), two baquettes (0.30CT TW) and constructed of 18KW gold. 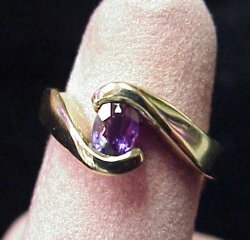 A very well made ring. 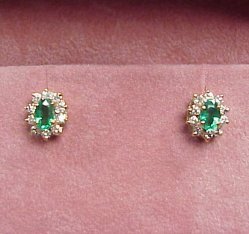 Gem quality 6 x 4mm bright green Emeralds set with round brilliant diamonds (0.60CT TW), H Color, SI Clarity in 14K gold. 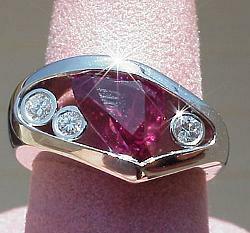 Elegant pear shaped, brilliant red Rubies (2.22CT TW) and round brilliant Diamonds (0.65CT TW), set in two-tone 18K gold. Free form style earrings with lever safety back. Our photos do not capture the true intense ruby red color. 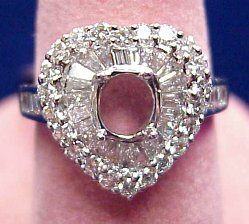 This beautiful heart shaped Diamond semi-mount ring is set with 0.49CT TW of round brilliant Diamonds and 0.45CT TW of tapered baquettes H Color, SI1 Clarity. 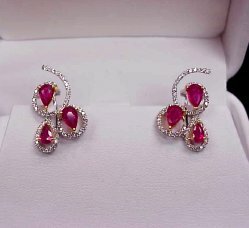 Just imagine this set with a firery Red Ruby or brilliant Blue Sapphire...the posibilities are endless. 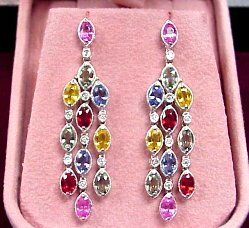 You will love the free flowing movement of these18KW Rainbow of Sapphire (6.92CT TW) and Diamond (0.12CT TW) chandelier style earrings. The colors are alive and bright. 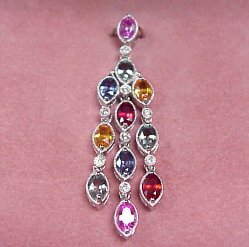 This 18KW Rainbow of Sapphire pendant has 3.46CT TW of marquise cut gem colored Sapphires and eight round brilliant Diamonds for an added touch of elegance. The colors are alive and bright. This is one of our favorite pieces. 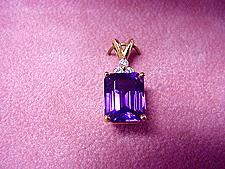 We were very lucky to find such brilliant colors in this rare Alexandrite gem. The stone weighs 0.43CT and is set in our 18K custom tension style mounting. Our pictures do not capture the true colors of this magnificant gem. 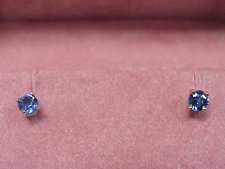 0.59CT TW Blue Sapphire earrings set in 14KW gold. These rich Blue Sapphires sparkle like stars when you wear them! 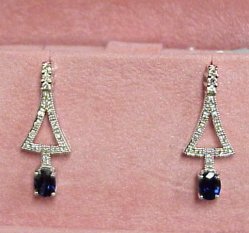 Micro-pave Diamonds enhance these beautiful 4 x 6mm Blue Sapphire drop style post earrings, set in 14KW gold with friction backs for a secure fit.